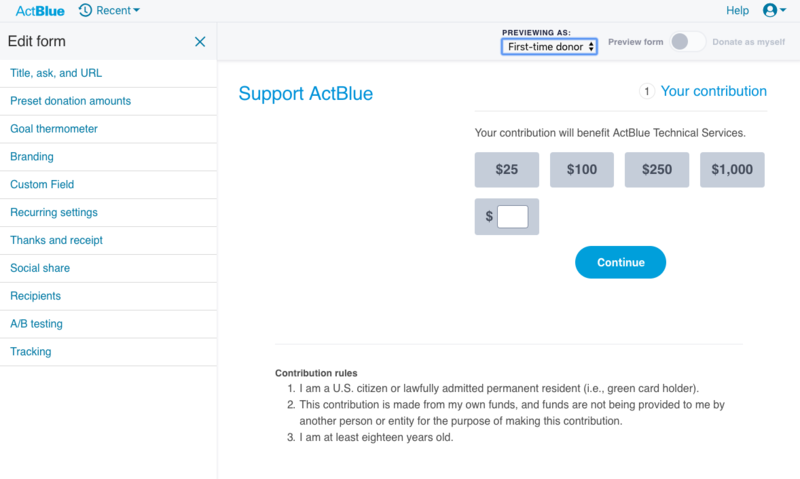 There are two types of ActBlue contribution forms: managed forms and community forms. 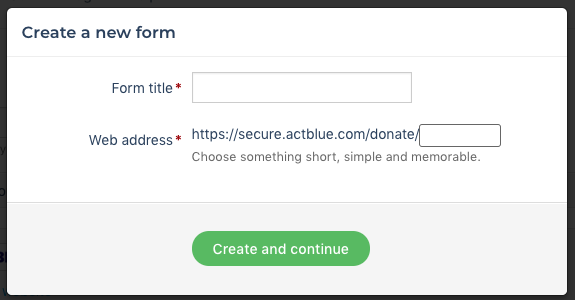 If you are an admin for an entity that uses ActBlue, you’ll use managed forms. Admins can find their managed forms in the Contribution Forms tab of their Dashboard. If you’re a supporter looking to raise money for your favorite campaigns and causes, you’ve come to the right place! 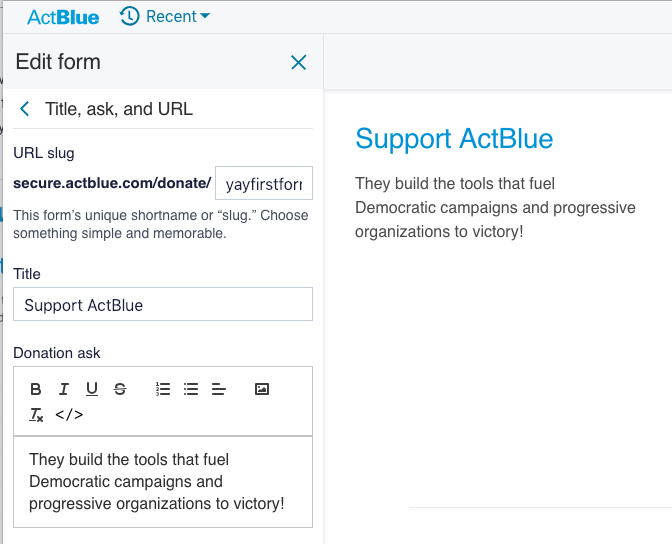 We'll explain how you can create community forms and start fundraising for groups that use ActBlue. Log in to your ActBlue account here or create an account here. 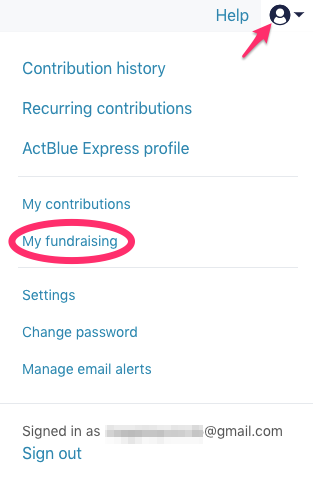 Then go to the User menu in the upper right corner of your screen and click on "My fundraising." 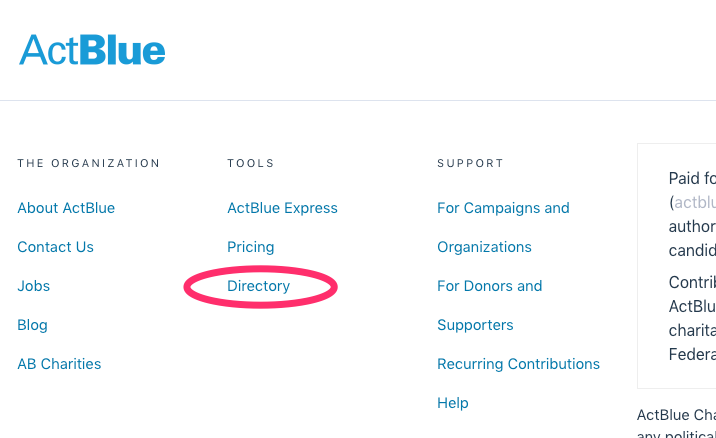 Look for the blue box titled “Create a new fundraising form” and click the orange button to search our directory of organizations that use ActBlue. Alternatively, you can open the Recent menu in the navigation bar at the top of your screen and follow the link at the bottom to the directory. The directory can also be found at this link or in the Tools section of the footer at the bottom of every page on our website. 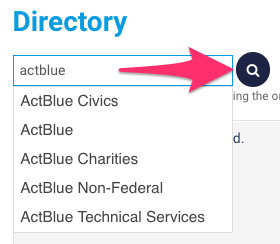 Type the name of the candidate, committee, or organization you want to fundraise for in the search box. 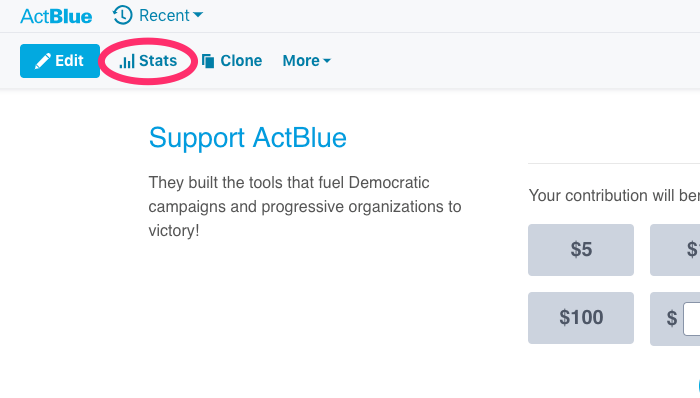 Click the blue magnifying glass button to see the list of results (if you click a name in the dropdown instead, you will go to a contribution page where you can donate to that group). You can also find groups by selecting one of the links in the gray box pictured above. Both of these actions will return search results that include an orange “Create contribution form” button. Once you've found the group you want to fundraise for, click its "Create contribution form" button to start making your community form. Then finish the web address for your form by typing a short, simple word in the “Web address” box. This word will be part of the unique web address for your form. When you click “Create and continue,” you will be taken to your contribution form and see the form editor open on the left. Now you can use the form editor to add important information to your form. You’ll be able to preview the changes you make to your form here in real time! Click here for tips on using the form editor. The first thing you should do is add a donation ask. Go to the “Title, ask, and URL” tab in the form editor. In the "Donation ask" box, write a short blurb explaining why someone should donate. Being specific about why you're invested in the cause will motivate your network to give. You can add basic formatting, like bullet points and bolding, and images to your ask. To add an image, click the picture icon and then just select an image from your computer. If you want to add HTML, click the "</>" button before typing your code. The next thing you should do is go back to the main menu of the form editor and open the “Preset donation amounts” tab. Here you can choose what contribution buttons appear on your form! 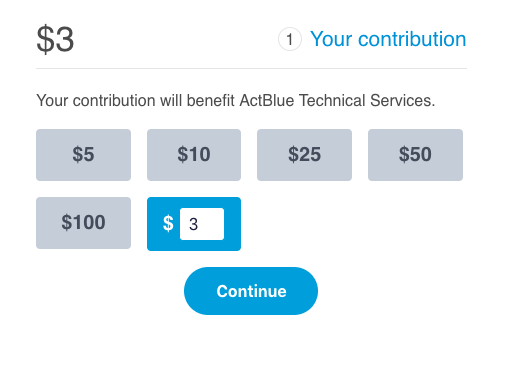 Presetting contribution amounts will make it easy for your donors to quickly choose an amount, as you can see below. Donors will always have the option to type in their own amount, but it’s a good idea to make sure the amounts that appear on the form make sense for the people you’ll be sending this form to. Next, go to the "Recurring settings" tab of the form editor. Your community form will automatically be set up to accept unlimited monthly recurring donations. 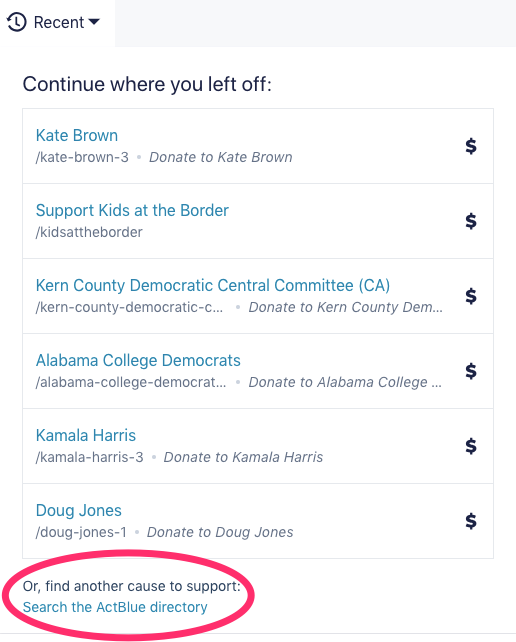 Your form will also automatically be set up to ask donors to make their contribution recurring if they give less than $101. Monthly, unlimited: When a donor contributes on your form and makes their donation recurring, their donation will recur every month until they cancel it or the campaign ends. Monthly, specified duration: When a donor contributes on your form and makes their donation recurring, their donation will recur for the number of months you specify. Monthly, unlimited + smart pop-up recurring: Smart pop-up recurring will ask one-time donors to give a recurring contribution that is smaller than their initial donation. 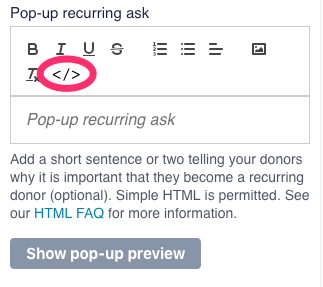 You can also create pop-up asks for all types of recurring contributions here, and customize them by adding an image or HTML. If you add HTML, be sure to click the “Show pop-up preview” button to make sure your HTML is working. Another great feature in the form editor is social share. This lets you customize the content that will be shared on a donor’s Facebook and Twitter account when they choose to share on social media that they donated. It’s a simple way to catch the eye of more potential supporters! To do this, open the "Social share" tab in the form editor and then fill in the fields. You can even create reusable and default social share settings here to save you time and effort in the future! Check out how to do that here. If you update your social share settings but don’t see the change right away, you should clear out your Internet browser’s cache and cookies. These settings are typically stored in an Internet browser’s Preferences. Look for a section in Preferences that deals with clearing browser data, history, cookies, or your cache and follow the directions there. 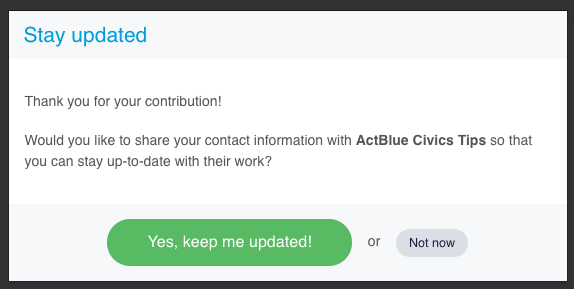 If you’re familiar with ActBlue contribution forms, you’ve probably seen some that have brandings. Brandings are custom templates for forms that have logos, images, and color schemes. 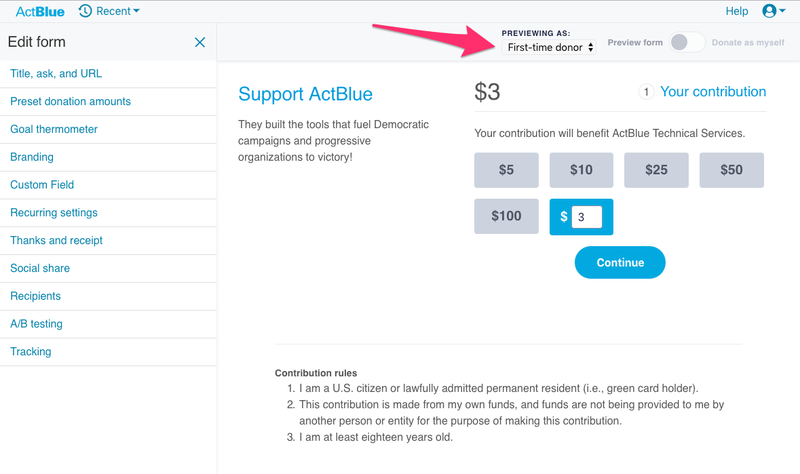 You can only add a branding to your community form if the group you are fundraising for has made their brandings on ActBlue public. If you go to the "Branding" tab in the form editor and see options you can select, that means they are public. If you don’t see any options, it means the entity has not made their brandings public. In the "Recipients" tab of your form editor, you can change your form’s settings to ask donors after they’ve given whether they want to share their contact information with the recipient group(s) on the form. By default, when a donor gives on a community form, their contact information is shared with every recipient group on the form. If you want to change this default setting for your community form, change the “Show email list permissions pop-up?” setting at the bottom of the “Recipients” tab to “Yes”. This will show a pop-up box to donors that asks them to opt-in to share their information after they have donated. To preview your pop-up, just click the blue “Preview permissions pop-up” button in the form editor. Please note that community form creators will always receive the contact information for all donors that give on their form (both those that opt-in and those that opt-out of sharing their information with the recipient group[s]). However, form creators cannot see which donors opted in or out of sharing their contact information with the recipient group(s). You can also add multiple groups to your community form in the “Recipients” tab, which will turn it into a Tandem Form. When a donor lands on a Tandem Form, they can easily split one contribution between all of the groups listed on the form. Once you're done making changes to your form, make sure you click the green "Publish changes" button to save them! After publishing all of your changes, close the form editor by clicking on the X in the upper right-hand corner. You'll still be on the live preview of your form, but now you'll see the form navigation bar at the top. 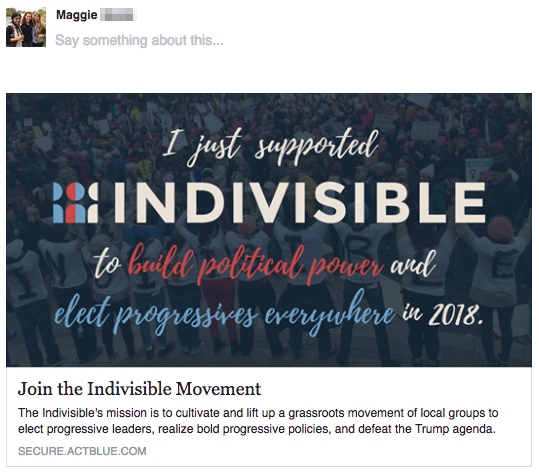 Click "More" and then "Promote" to start sharing your form! To send your form out to the world, just copy the link that’s generated on the top of the Promote page and paste it in an email, a social media post, or anywhere else you’d like to fundraise. This is also where you can create refcodes for your form. 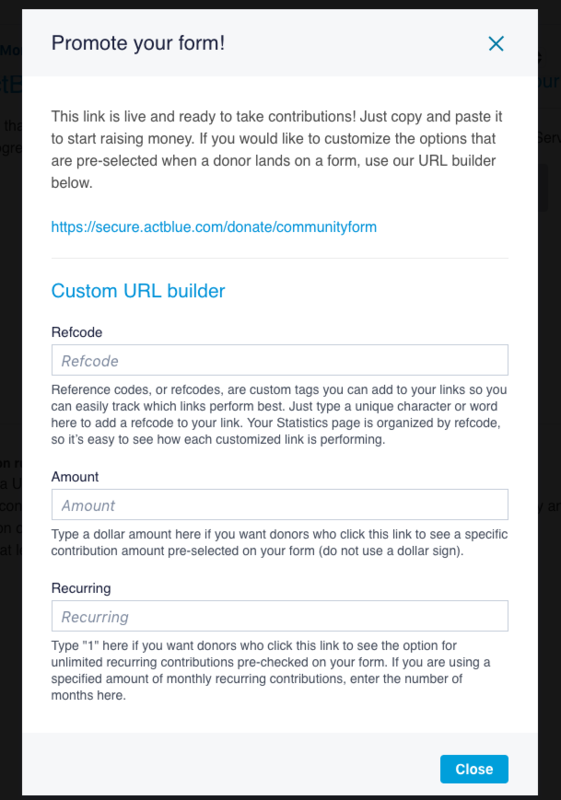 Refcodes are URL parameters that you can add to your community form links in order to collect useful data about where your donations are coming from. All you have to do is type a keyword into the Refcode box on this page, and a new link will be generated for your form. Then you can share that link like normal, and you’ll be able to track its performance on your form’s Statistics page (more about that in the next section, Data from community forms). There are endless uses for refcodes. For example, you could create refcodes for tweets, Facebook posts, and your website to track which platform brings in the most contributions. You can also create refcodes for friends that will be sharing your form to track their progress. 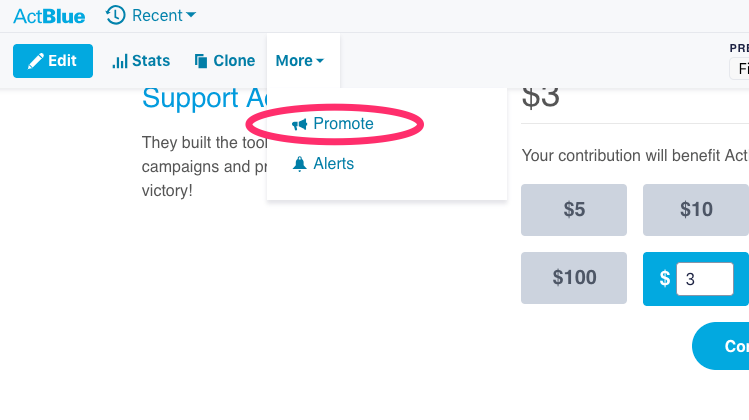 If you scroll to the bottom of the Promote pop-up, you can also preset the link to your contribution form so that donors who click on it will land on a form with the recurring contribution option pre-checked. You can see your list of forms on your My Fundraising page. 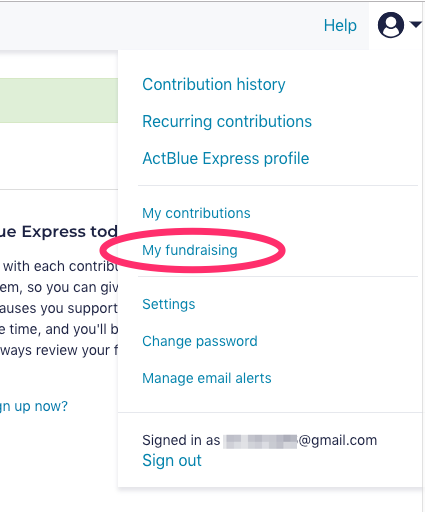 To view this page, open the User menu by clicking the blue icon of a person at the top of your screen, and then select "My fundraising" in the dropdown. Once you see your list of community forms, click on your form’s name to view the form with the Promote and Edit options. Your community forms have a lot of useful data. To access it, you will need to go to the Statistics page for your form. Once you are viewing your form, click the "Stats" button on the form navigation bar. The Statistics page will show you a table of the contributions made on that form, broken down by refcode. For each refcode, the table includes the number of contributions (Count), number of visits to the form (Visits), conversion rate, percent of contributions made on mobile, total amount donated with the average contribution size in parentheses, how many of the contributions made were recurring, and how much money was brought in by recurring contributions. Below the table, you should see an “Additional tools” dropdown. Open the dropdown menu and you’ll be able to download a CSV with the donor data (including names and email addresses) for all of your contributions. The admins for the group you are fundraising for on a community form will not be able to edit the form or view its Statistics page, but they will have access to the form’s donor data. If you are an admin for an entity listed on a community form, go to the "Contribution Forms" tab in your Dashboard. At the top of the page, you’ll notice a Managed Forms tab and a Community Forms tab. Just toggle between the two tabs to see a list of your team’s managed forms or community forms. In the Community Forms tab, simply click on the name of a community form to view it. Unlike managed forms, you will not be able to edit community forms made for your entity or view their Statistics pages. However, since the funds raised through these community forms go to your entity, you will have access to the donor data for every community form created to benefit your entity. To get your donor information from a community form, first find the date the community form was created on in your Community Forms tab. Then go to the "Reporting" tab in your Dashboard menu. Select the Downloads tab at the top of this page. With the "Contributions over a specified time period" report, you can download a custom CSV that will list the donor data for all of your contributions, including community form contributions. Simply use the date the community form was created on for your report's Start Date, and pick the End Date you're interested in (if you want to see all of the data since the form's creation, use the current date). Then click the gray "CSV" button to download the spreadsheet! Once you have the CSV for the time period you want, open it and go to the column labeled "Fundraiser Recipient ID" (A.K.A. contribution form name). Sort this column alphabetically. This will sort all of the contributions in your spreadsheet by contribution form name so you can easily find the donors who have given to you on a specific community form in your defined time period! If you need assistance at any point, reach out to us at support@actblue.com. Can I fundraise for more than one candidate or group using the same contribution form?